Three shakers fit in the space of one! Glide up doors and slide-out platforms (shown on center shaker), provide easy access to all flasks. Large*, easy-to-read display screen clearly shows operating parameter and actual value. Displayed parameters can be selected by user. A single knob selects all operating conditions easily and quickly. Programmable controller allows multiple-step parameter changes, eliminating unnecessary trips back to the lab. All electronics are easily accessed from the front of the shaker, eliminating the need to de-stack units for service. This side-view photo shows service module partially extended. 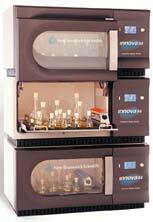 New Brunswick Scientific's Innova 44 Series Shakers can be stacked up to three units high (as shown), tripling the capacity of space usually occupied by a single incubator shaker. Based on the extremely popular Innova 4400 series, the Innova 44 includes many new standard features and the latest technology available. 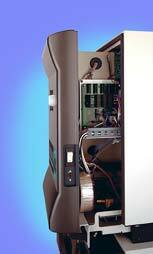 Innova Model 44 offers incubation, while Innova Model 44R adds refrigeration.